This is some addicting stuff. It's not the canned biscuit variety either, it uses a yeast bread dough. Totally worth it!! Confession -- D and I ate half of it over the course of about 15 minutes! Eek. And it makes a big pan. Sean would only take one bite. Kade loved it. 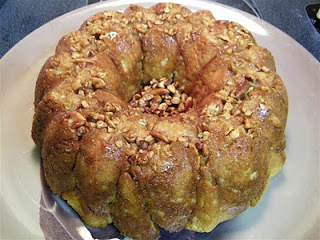 Of course my little monkey would like monkey bread, lol!! It starts with this Martha Stewart Recipe. Then, I tried some of the tips found on this post at Angry Chicken. And made some of my own changes. Instead of mixing the nuts into the coating, I just drizzled some butter in the bottom of the bundt pan and put the nuts just in the bottom. Makes it easier if there are some non-nut-lovers in the household (you could also leave out the nuts completely). I did add 1/2 tsp cinnamon to the dough itself when mixing. 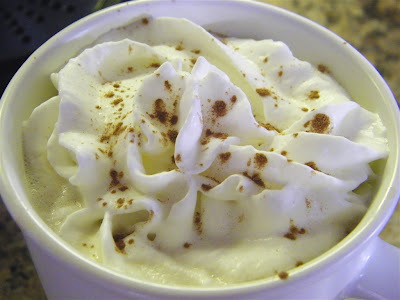 Love cinnamon. And I used butter instead of shortening in the dough...just because I felt like it! I mixed the melted butter, cinnamon and brown sugar for the coating, like Angry Chicken suggested. It worked okay, however I think I prefer to do it the regular way of coating the dough in butter, and then the cinnamon sugar mixture. Maybe. I think either way would work just fine. I didn't bother making the icing. It was plenty sweet enough on its own, IMO. That, and my kitchen was messy enough, LOL. Be warned, this does make a stickier dough. So don't think you've done something wrong. Seriously. Try this. 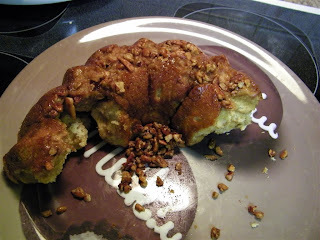 I was blog-hopping one afternoon when we were snowed in a couple weeks ago, and somehow wound up on the Angry Chicken site, and found the monkey bread post. I don't know if it's because I am pregnant (what I blame most things on, lol) or what but I just had to make this that day!! O.M.G. That looks so yummy! 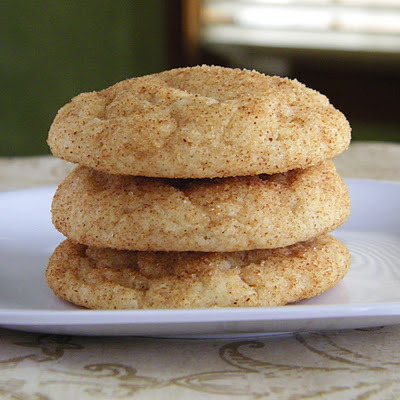 I LOVE the fact that this version doesn't use biscuit dough - that stuff is gross!